Wait a minute, you forgot that your budget for accommodation not exceeds 100 US$/day, which usually doesn’t buy you fast around the clock service anymore. Believe me, avoid further embarasement to remind your partner and yourself of your relative poverty. Lot’s of things you can do yourself before you have even dialed zero. Last month before we moved to Chiang Rai, I was reading a negative review about the hotel we planned to go to. ……also the fan in bathroom was extremely loud when you turned light on….no one wants a bathroom to sound like there sitting in a jet engine when they are trying to do there business…. After we checked in, indeed the fan was noisy, but I found it not really that disturbing. They say the more people are stressed, the less their tolerance towards noise will be. If I hadn’t read the comment, I probably would not have noticed. I mean: Welcome to Thailand. What I do notice in our room is the absence of sounds. Chiang Rai is a city where you still can go 500 m outside the centre and find almost near absolute silence. Anyway back to the noisy fan. While standing on the toilet pot, I tapped it once, after which the ‘irritating’ noise stopped. Practically all smaller fans have needle bearings and sometimes a simple tap is enough to get the needle back into its original position. Now, after one week it’s still running smoothly. Asking the maintenance guy for such a futile problem would just be too troublesome. Besides the waste of water, not being able to flush, somehow a running or leaking toilet doesn’t have the same healthy effect on your nightrest as sleeping next to a splashing stream or a river. Again you might call the maintenance guy. But in some cases eg. after drowning a brown doggy, this might be a bit embarrassing. If you simply take the ceramic top off, you will find that the big rubber plug at the bottom is not in the right position, lift and move it a bit to adjust. If it’s okay, the sound will change and the tank will fill up again. The last hotel where I did that was the four star Ramada D’MA Bangkok. If you prefer airconditioning in the night, take care that the are outlets is not directly pointing to your bed. You might catch a cold or wake up with irritated red eyes. Air Conditioners blowing directly at the bed or eyes is top ranking in some lists of complaints. One trick is to use adhesive tape eg. from your emergency band aid to direct the air outlets to the ground. This ranks no.3 in a list of complaints about hotels from CNNGo, just after paid and bad wifi in the room. Even in high range hotels the number of outlets is often very limited and often one needs to locate the plugs of bed lamps hidden behind a table. Nowadays the minimal number of sockets in hotels should be six, ie. two persons would both have a phone, camera and a tablet to charge. 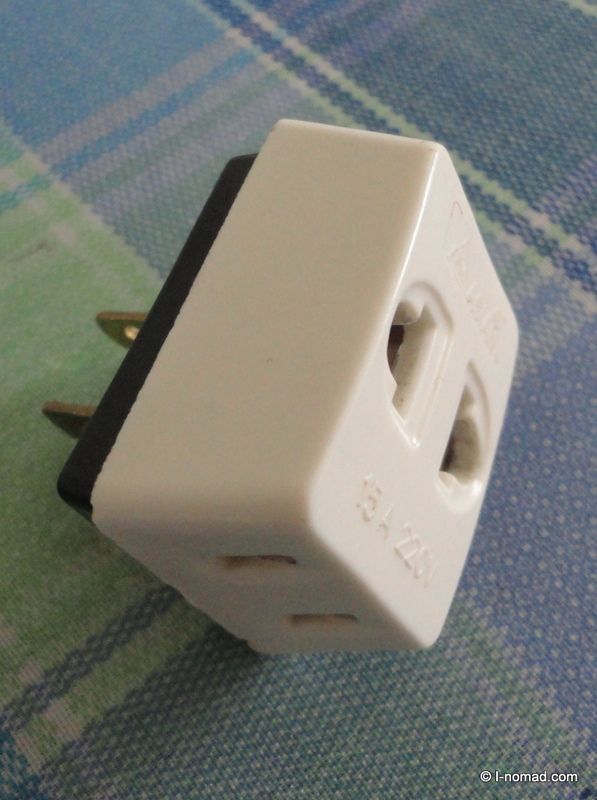 I used to have a old small European 3-way plug, but they actually have been forbidden from whenever I can remember. Something to do with safety; under heavy duty it could get too hot, and duetothe shape you could put a plug in sideways, so that one prong was in and the other out, which might give you an electric shock. Unfortunately my collecters item broke. In the feature image is a plug commonly available in Thailand in stores such as Big-C, Tesco-Lotus etc. this is a good alternative, provided you have US plugs. In other cases use adapter plugs. A small US to EU adapter will set you back 10 Bath or 0.03 US$ and provided you do not iron and blow dry at the same time or electrocute yourself by twisting EU-plugs, it’s even safe to use.